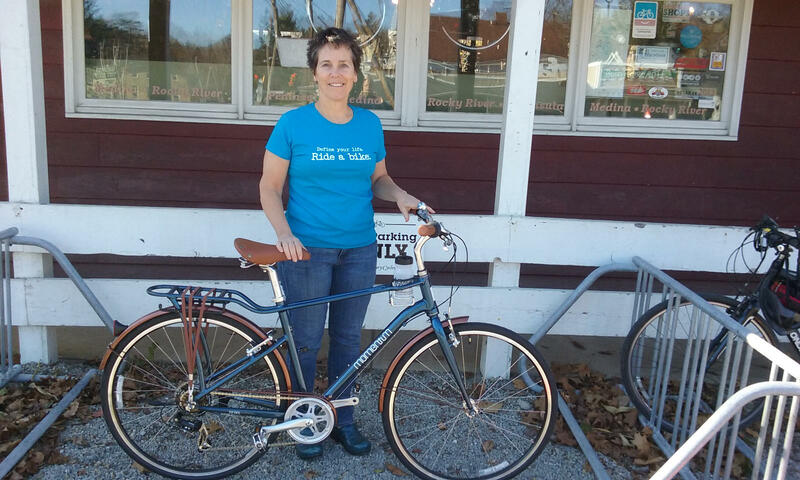 Century Cycles Blog: Congratulations to our WKSU bike winner! Congratulations to Donna Moot! She's the proud owner of a brand new bicycle, which we provided to WKSU to help with their Fall Pledge Drive! The bike is the Momentum Street, valued at $429.99! It's a great bike for getting around town for errands, with 7 speeds, a comfortable upright riding position, and comes with all the accessories you need -- rear cargo rack, full-coverage fenders, kickstand, a bell, and even a built-in coffee cup holder! Momentum Biking is the new lifestyle division of Giant Bicycles. The line also includes the new Momentum Rocker, the fat bike priced for anyone's budget, and now in stock in our stores! Thank you to Donna, and everyone who helped to support WKSU and public radio in Northeast Ohio!